After spending too much time following the flood news from southern Alberta, it’s time to post a rainbow. This image was taken just a week or two before the floods hit, on a quick trip to visit the farm (which is far from water so no worries about damage). Of all the comments I get from students and colleagues related to an article I wrote about my parents’ photography in the 1970s and 1980s, the image that always gets mentioned is Dad’s picture entitled “Rainbow’s End” which shows a massive rainbow over the now-vanished elevators at Pulteney. (shameless plug: article is here, with colour plates!) This is a pretty poor imitation of Dad’s work, although the building in the photograph is actually the last remaining “original” granary left on the farm. Ignore the fact that I’ve ignored most of the rules of composition. 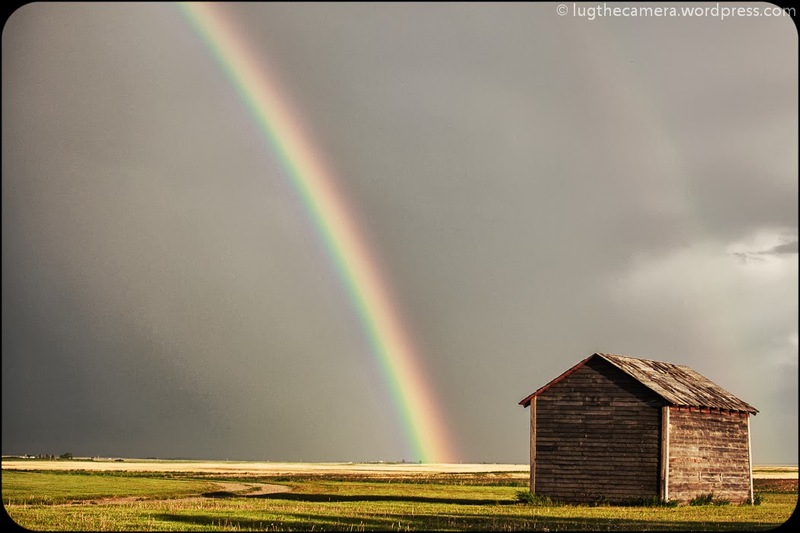 Rainbows aren’t unique to the prairies, but one sees them differently here, thanks to the wide horizons, vivid light, and fast-moving storm systems that can leave half the sky black and the other half brilliantly blue. Although I try not to get too (overtly) sentimental or romantic in thinking about and looking at prairie landscapes, it’s hard not to get all Kermit-y in the face of a rainbow.